Linda Collins | Fairborn Daily Herald Bath Township Trustees approved road maintenance on Clearcreek Trail in the township. BATH TOWNSHIP – The Bath Township Board of Trustees are moving forward with several road maintenance projects that will commence in 2018. In a 3-0 vote during the Sept. 20 township meeting, the board approved a contract with Wagner Paving, Inc. in Laura, Ohio to mill Clearcreek Trail in preparation for additional road resurfacing. The township will spend $8,500 on the milling project. According to Township Trustee Steven Ross, the amount is considerably less than $41,000 that was originally quoted. The profile milling will involve the removal of a half-inch of slurry seal on the .777-mile roadway. 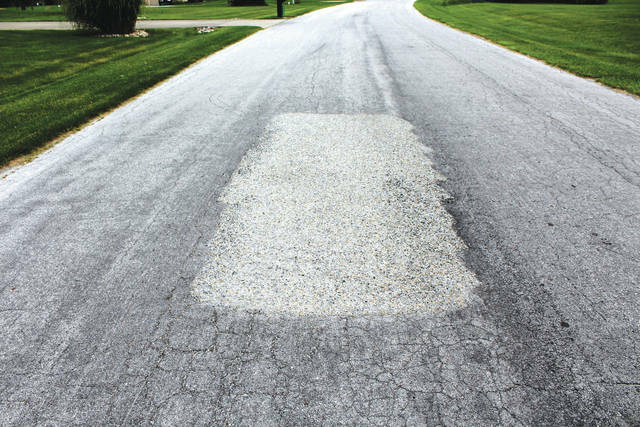 Township Road Superintendent Vern Heizer explained that the slurry seal, which is a cold mix of asphalt emulsion, graded aggregate and other additives, is not bonding to the under layer, and a slip plane has developed. Heizer consulted with Ryan Terry, an asphalt materials specialist with Strawser Construction, who recommended milling down the pavement before applying any type of asphalt surface treatment. Heizer noted that the paving contractor would also use an Elgin Pelican street sweeper to clean off the roadway following the milling process. According to Heizer, the contractor is charging $100 per hour to sweep the road, but the sweeping should not take more than 2 ½ hours to complete. As a cost-savings measure, the township road crew will haul off any debris from the project. Township Trustee Tom Pitstick asked Heizer if he had any idea why the slurry seal was not adhering to the roadway. Heizer explained that the slurry seal is an older technique that a number of paving contractors are no longer using because it does not bond well to some surfaces. As part of a pavement preservation strategy, the township will be applying a 2-inch overlay to Ravenwood Road next year, which will also involve the milling of the top 2 inches of asphalt. Heizer suggested obtaining an estimate from Wagner Paving Inc. for the Ravenwood Road project as well. Ross instructed Heizer to obtain an estimate from Wagner Paving for the Ravenwood Road project. Township trustees also approved a resolution authorizing a five-year intergovernmental agreement with Mad River Township regarding the repairs and maintenance of a .506-mile portion of Mud Run Road that is under the jurisdiction of Mad River Township. Bath Township has agreed to continue performing needed repairs and providing maintenance services to this portion of the road each year, including crack sealing and the trimming of roadside shrubbery and grass. In return, Mad River Township has agreed to pay Bath Township the full amount of annual tax revenue generated from this portion of the road, which will be due around March 1 each year. Ross said the collaboration that was first established in July 2011 has proven to be very beneficial for both townships. “This is a good deal for us because our constituents actually live on Mud Run Road,” Ross said. https://www.fairborndailyherald.com/wp-content/uploads/sites/50/2017/09/web1_IMG_3263-1-.jpgLinda Collins | Fairborn Daily Herald Bath Township Trustees approved road maintenance on Clearcreek Trail in the township.